open book – audio books: narrated or performed? Audio books make for pleasant car rides, especially with my girl. Though I’d never listen to hours of Raffi on a road trip (or any other setting, truth be told), I’ll gladly revisit favorite books from my childhood read by talented performers. A good audio book does require a good narrator. We’ve discovered some gems, like Stephen Fry’s renditions of A Bear Called Paddington and More About Paddington, and Mary Beth Hurt’s reading of The Fledgling. We’ve also borne some disappointments, like Eric Idle narrating Charlie and the Chocolate Factory. I like Idle well enough, but Meg wasn’t impressed. “When are they going to start talking? !” she wanted to know, and we finally understood her to mean, “When is the narrator going to adopt the voices of the characters?” I’m glad she’s not so demanding of her parents — she’s since contentedly listened to her dad read Charlie and the Chocolate Factory without ever expressing disappointment that the characters weren’t talking — but she wants her audio books performed. I’ve found that I share her sensibilities. I feel more engaged in the story when the narrator voices the characters, subtle though it may be. This has been harder to find than I expected, so I was delighted to discover a story I remember diving into as a child with a delightful narrator who successfully (for the most part) manages several characters in two accents. Though Kipling was English, I think the story, set in India, benefits from a narrator presenting an accurate Indian voice. Meg was enchanted. We listened to the story on our way across town, and when it ended on the way back, she asked to start it over. She then had her first experience of something all audio book listeners will recognize: sitting in the car outside our house to hear the story through (once again) to the end. 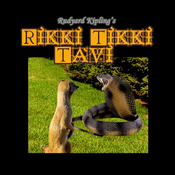 Go get your free download of Rikki Tikki Tavi read by Sumeet Bharati from Audible.com. But before you do, tell me: What are your favorite audio books? Thanks! I think we’ll try this. I think I said before we haven’t had luck with audio books before, but every few months things change, right? Hey Carrie. I think this might be a good one to start with. It’s short, so you can listen in one go, plus it has lots of unusual animals. I don’t think I know of a kid uninterested in animals. Then again, if he insists on silence in the car, I’m not sure there’s anything that would win him over. We’ve loved the paddington books. There is another one Fry read called Paddington Here and Now. We also liked the performances of both Winnie-the-Pooh books, read by a cast including Judi Dench and Stephen Fry. Recently, we’ve been listening to The Lion, The Witch, and The Wardrobe read by Michael York. The only annoying thing is that his narration is in a soft voice, as is his rendition of Lucy, but many of the other characters like Mr. Tumnus, are quite loud, so I’m always fiddling with the volume control. We enjoyed the Rabbit Ears productions of Kipling stories (How the Rhino…by Jack Nicholson, How the Leopard…by Danny Glover, The Monkey People by Raul Julia). I hated the CD we got of Dr. Seuss read by a variety of American comedians. And Mr Poppers Penguins read by Paul Hecht was okay, but a bit boring. We love the books in the hanging bags at the library that come with a CD. Our favorite is When the Relatives Came by Cynthia Rylant. Although there have been others like Hansel and Gretel retold by James Marshall and the ones by David McPhail. While not performed, the E.B. White recorded books read by the author are beautiful. I love to hear these classics read how he intended them to be. It may be that an adult would appreciate them more. We’ve done very few audio books… not so much because of presentation but mainly because I have a hard time finding stories that I can fully stomach. A month or so ago, I checked out the Rikki Tikki book (with CD) — in an attempt to find some audio books. But we never listened to the CD because after the reading the book I felt uncomfortable with how “evil” the author portrayed the snake. The snake is just eating the food it has evolved to eat… I understand the book is from a different time period, and that there IS a conflict of interest between the parties, but I find myself not wanting to inundate my child with stories that are written without giving understanding to both perspectives. On my good days, I can talk this stuff over with my son, but on my not-so-good days, I am already so fatigued with trying to find peaceful solutions to the conflicts we face everyday that introducing additional conflicts that are resolved violently just puts me over the edge. Sorry to go off on Rikki Tikki here! How did/do you handle the death/murder of the snakes and all their children with Meg? I usually download audiobooks, I haven’t checked out books on CD from the library. I’m glad for the additional suggestions that I can find there. We loved Charlotte’s Web read by E.B. White (see my post E.B. White and the spiral). That was Meg’s first audiobook. I take your point about the snakes just needing to eat, but I don’t expect the tale to make that point. In literature, I’m interested in the story and the characters and in some element of truth in the telling about experience and emotion. I don’t expect truth to concern (or even necessarily include) facts. In this case, the narrator presents the tale from Rikki’s perspective, and in doing that his knowledge and sympathies are necessarily limited. It gave Meg and I a chance to talk about who was telling the story, and how it might go if it were from Nag’s perspective. Ultimately, she decided she was glad Rikki Tikki Tavi killed the snakes, so his friends could be safe. I’m fine with that.